On a hot and humid summer Sunday in Marion, Ala., there are few places open to find refreshment. One oasis, however, can be found at 207 Washington St. at Lottie’s Restaurant, where visitors can enjoy a hot plate of comfort foods like warm mac & cheese and fried chicken. Lottie’s opens at noon on Sundays, just in time to accept and serve the after church crowd and this day was no exception. Several groups and families gathered together at various tables to enjoy a good, Southern homemade meal. 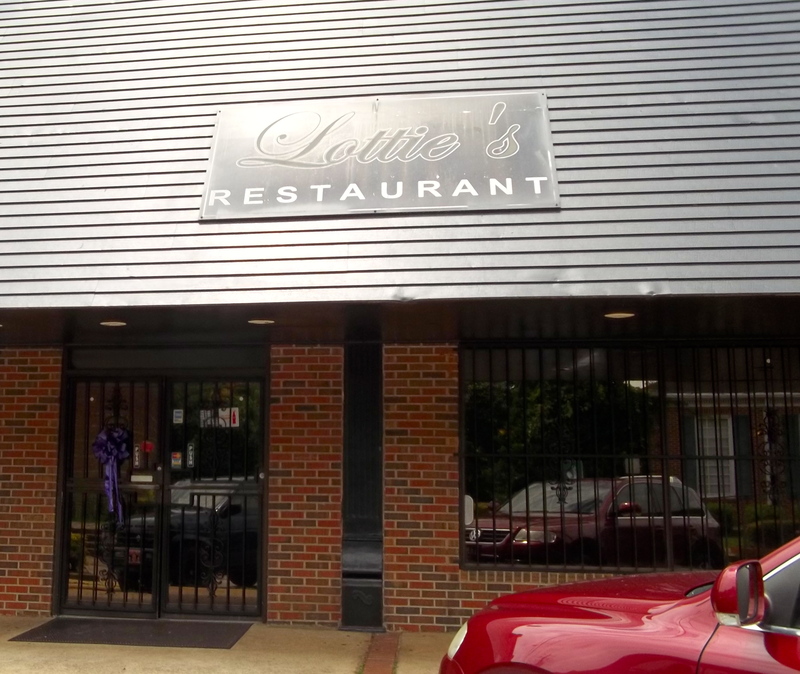 Named after the owner’s mother, Lottie’s Restaurant was established in October of 2005. Since then, the family-owned restaurant has proudly served the citizens of Marion as well as customers from the neighboring communities of Greensboro, Centreville and Selma. 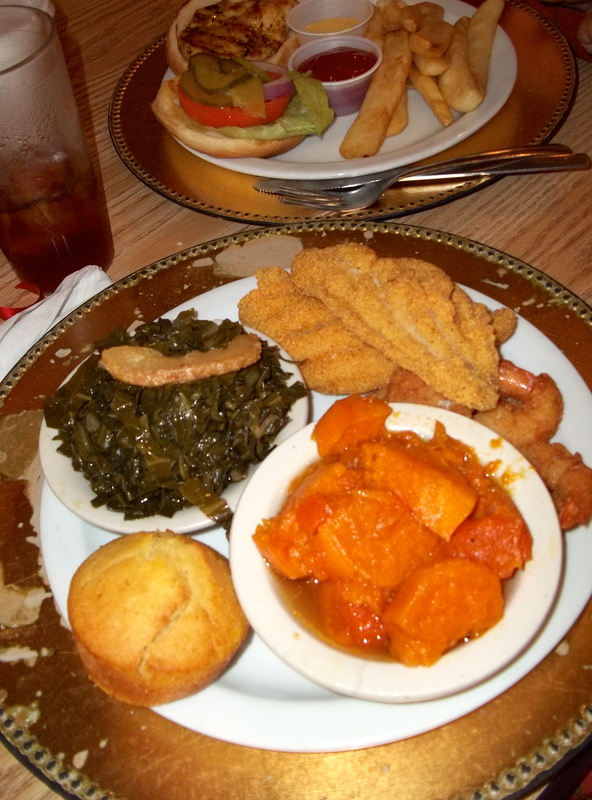 A favorite dish of Lottie’s patrons is the freshly cooked catfish, which can be either grilled or fried. All meals come with two sides, and each one is sure to be delicious. 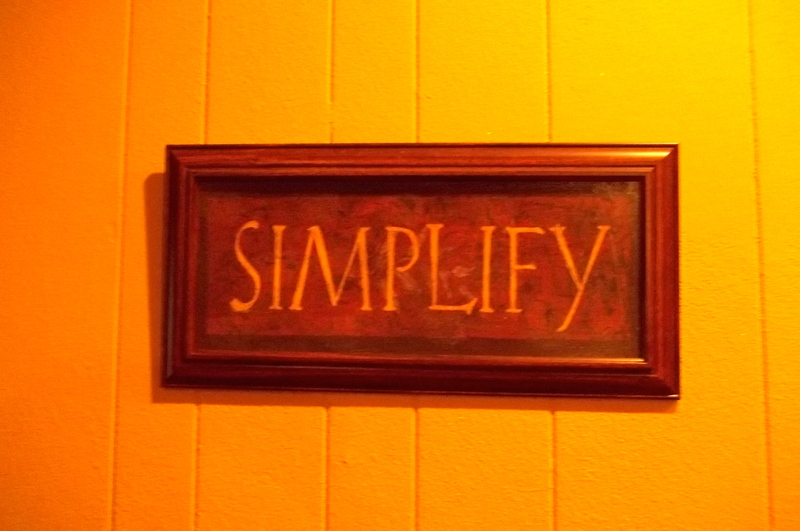 Lottie’s Restaurant is not just a place for eating. 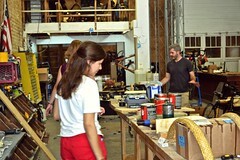 It is also a place to gather with your friends and family and just enjoy each other. There are two TVs in the restaurant. On the Sunday of my visit, they featured a baseball game and a NASCAR race. Prospective customers can book entertainment as well to play on the small stage at the back of the restaurant. Just the other day, Lottie’s hosted a small play and a jazz concert. This particular day, I visited Lottie’s with a few members of my family. My father, mother, and nephew all accompanied me on my first visit. As out-of-towners, I expected to be scrutinized, but the atmosphere in was incredibly relaxed and I felt at ease. Jazz music was playing lightly in the background, and the servers were all very friendly. The varied accoutrements of the restaurant, from the lighted sconces and photos of Lottie on the wall to simple diner-like tables and chairs, set a mood much like that of an family gathering, comfortable but also refined. It was especially perfect for a Sunday. Now, onto the food, which I have heard described as the perfect “soul food.” There were a good number of choices on the menu, and it was hard to make my pick. I was hungry and everything sounded amazingly tasty. Eventually, I ordered the Sunday special, which was comprised of two pieces of chicken (dark and fried for me), dressing topped with gravy and jellied cranberry sauce, candied yams, collard greens, and a corn muffin. My mother ordered the catfish, while my father ordered a hamburger, and my nephew ordered a kid’s meal chicken sandwich. At the end of the meal, we ordered dessert, of course. Sweet potato pie and pound cake were the goodies we decided to top our meal off with, but the red velvet cake and the apple pie sounded equally as appetizing. All in all, the food was just as great as the rest of the restaurant. 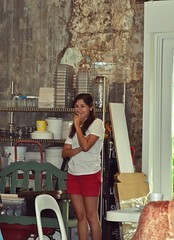 After eating and paying for our meal, we all walked next door to the Anderson~Barnes Antiques. The close proximity between the restaurant and the antique store seemed to be popular amongst the customers at Lottie’s because my family was not the only group that ventured into the shop after their meal was thoroughly enjoyed. Lottie’s Restaurant and the antique shop, As Time Goes By, are both spaces frequented by the citizens of Marion. They are places to stop and chat with friends or places to remember history. At Lottie’s, customers are able to remember their own home-cooked meals of the past, and Lottie’s legacy will always be remembered. At the antique store, each item brings back memories of a different time. The owner of As Time Goes By told me how he was good friends with the late Mary Ward Brown, author of “Tongues of Flames” and other books, whose recent death made it into the New York Times’ website. He told us how Brown would always come into the small store in search of jewelry and how she would be missed. It is places and moments like this that form the foundation of a community. A small gathering place, outside of work, or even church, where friends and family can commune with each other on a lazy Sunday afternoon without the hustle and bustle of the workweek is a much needed and often overlooked aspect in many communities. Luckily, Marion still holds onto hers, and it does not look like her citizens will let go any time soon. The historic Perry County Courthouse is nestled right in the heart of the small, rural town of Marion, Ala., the seat of government for Perry County. Newly renovated, the courthouse is the perfect representation of Marion. The town wants to celebrate the beauty from its past while building a bright future, and it is not afraid of a little hard work to get there. 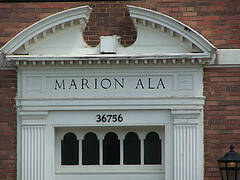 A ringing bell and recollections of a happy childhood are not the only thing that comes to mind when viewing the imposing white building on 1710 South Washington St. Marion was the site of crucial moments during the Civil Rights Movement. In 1965, Jimmie Lee Jackson, an unarmed black man, was killed in Marion by James Bonard Fowler, a white state trooper. 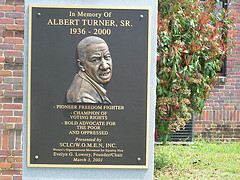 This event sparked the Selma to Montgomery marches. Inside of the courthouse, visitors must go through a security check but the guard on duty the day of April 9, 2013, was kind and made friendly jokes. A new addition to the courthouse is an elevator, a stark contrast to the original wood seats left in the courtroom. Inside the courtroom, sunlight floods in through the large windows on the back wall. Easley says the hardwood floors are a new addition as well. “They got rid of all the ugly green,” says Easley, as she gestures to the witness stand and the jury deliberation room. There are two sections for the audience to sit in the courtroom. One of the left and one on the right, separated by an entryway. There are 104 nice but worn wooden seats in each section. 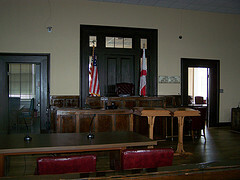 The empty courtroom looks more like a lecture hall than a place where law is upheld. Six large, sectioned windows cloak each of the sections of seats in brilliant sunlight that leaves the darkened courtroom looking ghostly and regal. The judge’s bench is guarded by the American and Alabama flags. The bench looks imposing, and the witness seat does not look inviting. 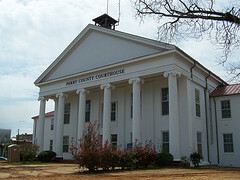 The Perry County Courthouse was erected in the years 1855-1956. The first time it was renovated was in 1954, roughly a decade before the Civil Rights movement took off. The courthouse may be open to the public once again, but it is not completely finished with its improvements. Dry, cracked red dirt stands uncovered on the outside. A piece of white construction machinery, a Bobcat S130, stands guard out front and Port-a-potties are left outside, a reminder that there is still cleaning up to do. The post office is right across the street from the courthouse. A few citizens who had business to tend to at the post office linger outside and regard the stately, eggshell white exterior of the Perry County Courthouse. The Perry County Courthouse is a mix of new and old. Many people have trafficked through the corridors and up the old staircases and many more will tread up the new staircase and ride the new elevator. The restoration wasn’t due to just the courthouse’s need to be redone. It was done for the benefit of the citizens who look at it day by day, who remember the bell tolling every hour on the hour when they were children.